244 p., 14,7 x 20,8 cm. With contributions by Susann Heenen-Wolff, Wolfgang Hegener, Sebastian Leikert, Elfriede Löchel, Charles Mendes de Leon, Bernd Nissen, Rolf-Peter Warsitz and Stefan Wolf. This volume of the ›Jahrbuch‹ addresses the issue of the different ways in which analysts give an account of their treatments and put them forward for discussion. The case vignette is widely accepted as a form of scientific documentation of qualitative data, especially of rela-tionship data. The thematic focus of the ›Jahrbuch‹, however, will not be on the issue of scientific status but on the aesthetic dimension of the psychoanalytical case vignette. By what means does the psychoanalytical case vignette attempt to do justice to its specific subject, the unconscious dynamic of an analytical process? Thus psychoanalytical case vignettes work with narrative, condensing, metaphorising elements, organising the time structure of what is experienced, using verbatim notes of the sessions, selecting typical or unique sequences in the course of treatment. The presented case is never just documentation; it is always a construction and ultimately a fiction. On the basis of materials, a context, a process, a course are construed which may follow different patterns (e.g. »development«, e.g. »oscillating«, e.g. »turning points«). This presents not least the way the analyst conceptualises the treatment, which explicit and implicit theories he employs. The psychodynamic of the analytical encounter, from the initial contact, mostly by telephone, to the last word of the written version, subsequently undergoes constant modification. A good case vignette makes the recipient feel something of this dynamic. Along which ways has what was heard and experienced been transformed into writing? Has the enhanced perception of intersubjective unconscious processes and enactments changed something in the form of the case vignettes? How in each individual case do form and content and how does the singularity of what is experienced and communicable relate to each other? Would we not have to invent a new form for each patient, each treatment, each analyst? Or would that affect the ability to compare, to discuss and to assess? Do the diverse analytical schools differ in the way they present case material? The article is divided into two parts: an introductory theoretical essay and a detailed case history with the title »Sonja’s World«. The author initially discusses a possible belletristic self-misunderstanding of Sigmund Freud. Next, he describes the character of a psychoanalytic case history as a nonfictional story. Some concepts of narrative theory are used to take a closer look at the relations of form and content. The author places emphasis on the singularity of the analytic experience of both protagonists. The analyst’s writing strategy tries to make those strings of singularity resound in his text by using certain narrative elements. The author points out that the question of the aesthetical dimension of the case study leads to a core issue of psychoanalytical science. If Freud says that his case studies read like novelas, this implies that the psychoanalytical type of knowledge cannot be found by the research methods of other scientific fields. Neither psychology, with its statistical methods, nor philosophy and religion promote a type of knowledge which seeks to do justice to the individuality of the specific human subject. Art, however, is interested only in uniqueness. Psychoanalysis and art are rooted in the same emancipatory ethical impulse: representing the uniqueness of the human subject. Beside this, the case study seeks to be aesthetical in two more ways. Firstly, it aims at representing the events reported in a vivid and figurative language. Just as literature does, it invites the reader to become a co-creating participant of the reported scene. Secondly, »aesthetic« in the Greek language means perception. The aesthetic field is the field where meaning is created by organizing perceptions. Music, for example, is nothing but an organization of acoustic perceptions. Nonverbal kinaesthetic dimensions play an important role in the therapeutic process and find access to the writing of case studies. These considerations are discussed by analyzing a case report of Steven Knoblauch (2000), who focuses on the musical edge of the therapeutic dialogue. 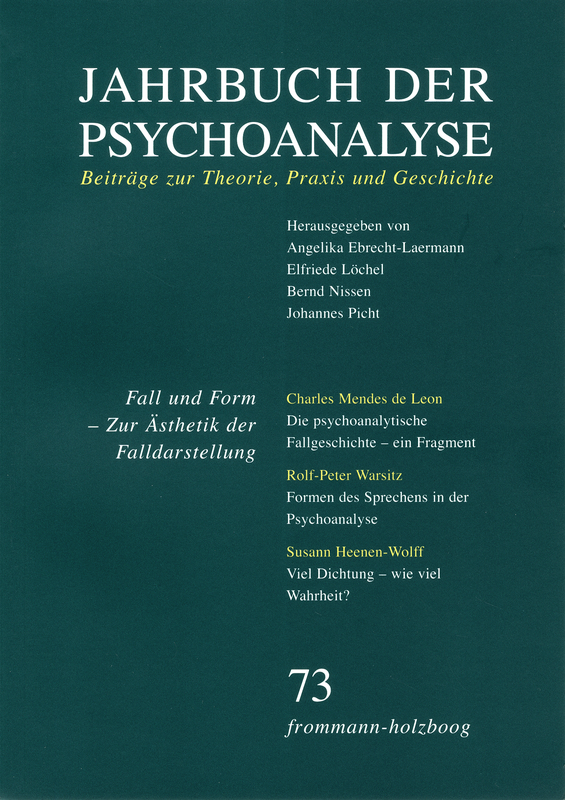 The author distinguishes two established forms of speaking in and about psychoanalysis: The concept of the novelistic form is based on Freud, whereas the concept of verbatim records and objectifiable patterns of interaction was designed to overcome the lack of scientificity of the novella. The concept of case presentation as essay, in the sense of Theodor W. Adorno and Julia Kristeva, is established as a third form. The psychoanalytic method of knowledge (i. e. the dialectics between free association and evenly suspended listening) implies the claim to find an adequate form of reception, recording and reflection according to the »nature of the subject« (Freud). Some epistemological specificities of the heuristic approach in psychoanalysis are tackled, with a focus on case stories. The author investigates the different endeavors to cope with the subjectivity of the writing analyst in contemporary psychoanalysis. The author tries to show that Freud’s »pictorial description« of melancholia intuitively captures the wide range of severely depressive dynamics better than precise terminology. Melancholia may include dynamics of objectal reproach and of severe autistoid constellations which can be seen as a defense against breakdown. Winnicott’s conceptualization of breakdown is discussed briefly. Based on case material, this dynamic is briefly outlined and it is shown that such an analytical process includes both the development of the defense of the breakdown and is headed for presence moments. Such processes are not bipersonal, but have to be conceived as decentralized. In the creative and in the analytical process similar transformation processes take place. In order to illustrate the relatedness of the two processes, three ego constitutions are initially described which the artist regularly passes through in the creative process during the creation of the picture in order then to outline the corresponding constitutions of the analyst in the analytical process. Awareness of the similarity of the two developments can help the analyst to allow phases of not knowing and of disorientation as unavoidable phenomena of the therapeutic process that promote analytical creativity. Referring to a new publication about Freud’s atheism (Will 2014), the author continues the controversial discussion about the Jewish roots of psychoanalysis. This article concentrates on two topics in this debate: Firstly, the statement that Freud was a »Hellenic pagan« and that his world view was completely un-Jewish, respectively anti-Jewish, is criticized. The author tries to show that Freud’s references to the ancient Greco-Roman world of philosophy and literature was his »entrée billet« to the German-speaking culture of assimilation and anti-Semitism. But Freud discovered and asserted the Jewish legacy behind the ancient world. Secondly, the assumption is debated that Freud was a proponent of the European Enlightenment and posed himself in the tradition of the Reformjudentum and the Kulturprotestantismus. However, a detailed historical reconstruction shows that the Reformjudentum rejected especially that part of Judaism that was relevant for Freud: the rabbinic and Talmudic Judaism with his textual tradition. One can see this orientation particularly in his Interpretation of Dreams; there, Freud reads dreams as a »holy text«. Based on a close reading of »Triebe und Objekte« (1981) this paper deals with Wolfgang Loch’s theory of the »origins of the world of emotional objects«, namely the beginnings of psychic representation and psychic structure. Loch’s investigation of early developmental processes is seen as tackling important questions and anticipating current psychoanalytic thinking. His putting together of heterogeneous approaches and concepts in a rather arbitrary manner, however, is criticized by the author. Loch’s claim to parallelize the philosophic, especially Kantian, principles of transcendental logic and psychoanalytic developmental thinking, is seen skeptically. His undifferentiated use of the concepts of »Ding« and »object« is pointed out. On the other hand, the author appreciates Loch’s original concept of the function of father/the third and links it with contemporary literature. Loch’s interpretation of »primary identification « as identification with a »primary aggressor«, conceived by Loch as identical with Freud’s »father of personal prehistory«, leads him to an understanding of the symbolic on the basis of negation.